Once again with horrible sadness in our hearts, Blake and I have lost Rubie – another one of our beloved “oldsters”. Rubie came to us May 6, 2011. We had recently lost our beloved little one Mia, and were looking to give another senior doggie a home. Lo and behold – Rubie was available!!! 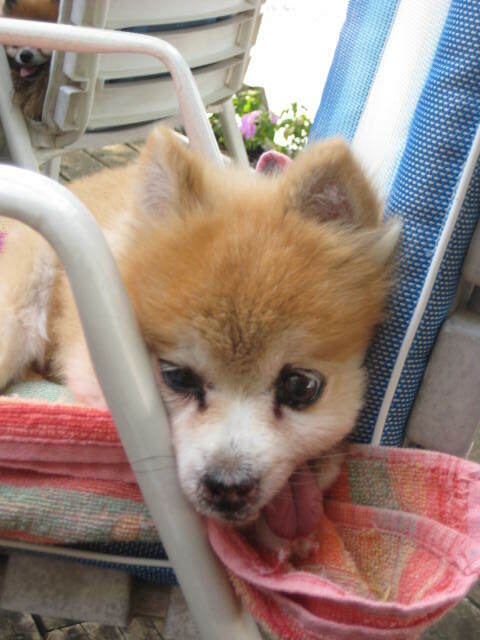 She looked perfect for us – the perfect Pomeranian, 10 years of age, and no teeth! We picked her up on Saturday – and she quickly assimilated herself!! She bounced around the backyard meeting her new brother and sister, although – Yeti – true to form – snarled at her from the get go! She handled it perfectly – snarling right back at him!. She quickly worked her way around the house – hardwood floors – check – not a problem – stairs – check – not a problem!!! Locating the beds, the food bowl and each of the water bowls – check – not a problem!! And then as Blake left the house to do errands that afternoon – she latched on to me – to which I joked to Blake when he came home – that “maybe you should get yourself a dog” – as Scout – well – she’s her “own dog” – and Yeti – completely mine…. But – we soon found out – Rubie was Blake’s dog – becoming a wonderful substitute to Blake for his beloved Mia….. Sadly though – It didn’t take us long to realize that she must have endured a very difficult first 10 years….she was a biter ……with no teeth – she couldn’t hurt us – but it just pained us to think what in such a sweet dogs life could bring out that kind of defense mechanism…..But , as she learned the joys of being picked up and cuddled, she became less “feisty”….. Her vision wasn’t the best right from the start, and sadly continued to deteriorate, along with her hearing – to the point that the last year she had little hearing or vision left……but – no matter!!! She would spend hours in the backyard, sniffing, enjoying, standing, wandering, sniffing some more – just enjoying!! We would say she was out “snubering”! and that too became another of our favorite pet nicknames for her – Rubie Snubers! She remained mobile and frisky till the end – she physically navigated the stairs – although her vision made the journey down tentative (and indeed, in the last month – she would ask for “help”) – right to her final few days . She was in pretty good health, her appetite was good (she really enjoyed her food), and even her “summer grooming” told us she was healthy…..the last two summers she had enjoyed a “day at the spa” – giving her the cutest summer clipping……..but two months later – she would have her full coat back!! But last week, although still enjoying her food, she couldn’t keep it down, and Saturday morning we woke to find she was barely walking………she left us Sunday afternoon, peacefully, with Blake and I beside her……. We miss her – she had such character and personality…..
Sylvana, once again, we thank you for bringing Rubie and Bepino and Gemina and Mia and Yeti into our lives……. We thank you and all the fosters and volunteers of the PSBR for giving these beloved animals and their new homes such incredible joy.